Charlotte Visitors Guide - Your Resource to All Things in the Queen City! ← Jimmy Buffet invests in the hottest new trend – Active Adult Living! Charlotte Visitors Guide – Your Resource to All Things in the Queen City! 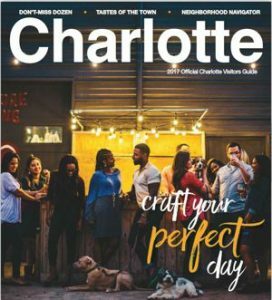 The new Charlotte visitors guide is packed with information that even a long term resident of the area will appreciate! For those new to the Queen City, it contains details about neighborhoods around town and suggestions for the best ways to experience the culture, sports, and arts scene in the area. For long term residents, there are articles about Charlotte landmarks and fresh ideas for places to visit this weekend with friends. And, don’t forget to keep this guide close by as a resource to find great restaurants and experience the fantastic culinary scene Charlotte has to offer! Click here to view the Visitors Guide online.